Viktor Yanukovych, the winner of Ukraine's presidential election, has called on his rival to abandon her protests and resign as prime minister. Yulia Tymoshenko's camp has said it is determined to challenge the results of Sunday's vote in court, and wants a recount of votes in certain places. But international observers gave the election a clean bill of health. Electoral officials have now counted all the ballots, and say Mr Yanukovych won by a margin of 3.48%. "I call on the prime minister to resign and go into opposition," Mr Yanukovych said in an statement posted on the website of his Party of the Regions. "I want to remind Mrs Tymoshenko that the basis of democracy is the will of the people. Democratic leaders always accept the results of the elections. The country does not need a new crisis," he added. 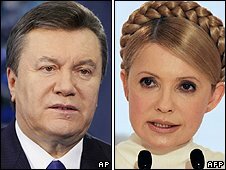 Mrs Tymoshenko has not issued a statement since Sunday night, leaving confusion over her position. Members of her party have said they will contest the result, and the Interfax-Ukraine news agency said a recount was already under way in the Crimea region. However, another party ally predicted she would concede within days. Correspondents say Mrs Tymoshenko is under heavy pressure to accept the result. The EU and US endorsed the conduct of the election, and Russia has congratulated Mr Yanukovych on his success. International observers said the election had been transparent, unbiased and an "impressive display" of democracy. Observers from the Organisation for Security and Co-operation in Europe (OSCE) were unusually blunt, warning the country's political leaders they should listen to the people's verdict and make sure the transition of power was peaceful. Releasing their final vote tally on Wednesday, the Central Elections Commission said Mr Yanukovych had garnered 48.95% of the ballots to Mrs Tymoshenko's 45.47%. Some 4% voted against both candidates, while 1.2% of the ballots were spoiled. Voter turnout was about 69%. On the streets of the capital, Kiev, Yanukovych supporters have been gathering, hoping to bid a final farewell to the Orange Revolution. Mr Yanukovych was pronounced the victor of the 2004 election, only for the result to be over-ruled because of vote-rigging, following Mrs Tymoshenko's Orange uprising. "At last, the victory that we have been waiting for," said chef Galina Khomchenko, 43, as loud music blared from the stage set up in the square. "This Orange nightmare has finally come to an end."